To Cite: Khoshkhouy Delshad H, Nilipour R, Barekatain M, Oghabian M A. Neural Correlates of Visual Confrontation Naming in Persian-Speaking Individuals: An fMRI Study, Iran J Radiol. 2017 ; 14(2):e17875. doi: 10.5812/iranjradiol.17875. Background: Neural correlates of visual confrontation naming (VCN) have received considerable attention in previous literature. Recently, there have been a few studies that have reported the activation of the hippocampus during VCN tasks. Whether or not the hippocampus is directly involved in picture naming has clinical importance for patients with refractory mesial temporal lobe epilepsy (MTLE) who should undergo anterior temporal lobe resection (ATLR). Objectives: In this study, we investigated the neural network of VCN and the role of the hippocampus in Persian-speaking individuals by functional magnetic resonance imaging (fMRI) VCN paradigm. Subjects and Methods: Twenty right-handed, healthy, Persian-speaking adults underwent fMRI while performing VCN task. Pictures were selected from a Snodgrass and Vanderwart dataset that was normed for Persian speakers. VCN performance was assessed and entered as a covariate in whole-brain analysis. Region of interest (ROI)-based analysis was also used to obtain more accurate results. Results: Activation in the left hippocampus was significantly correlated with VCN performance. Participants with higher scores showed greater fMRI activation in their left hippocampus. Activation in left occipitotemporal regions, such as the left occipital fusiform gyrus, left temporal occipital fusiform gyrus, left temporal pole, left middle temporal gyrus, and left superior temporal gyrus also showed significant correlation with VCN performance. The main effects of VCN were also found in frontal and occipital regions, such as the left inferior frontal gyrus, right inferior frontal gyrus, right orbital frontal gyrus, right lateral occipital gyrus, right occipital fusiform gyrus, and right occipital pole. Activation in the inferior frontal gyrus was significantly left lateralized among all of the subjects. Conclusion: These findings suggest that good naming ability depends on fMRI activation in the speech-dominant hippocampus. We also found that a left-dominant network of occipitotemporal regions plays a dominant role in VCN performance in healthy Persian-speaking individuals. Picture naming is a fundamental linguistic skill. It has been commonly studied in the context of semantic memory, which requires the integration of several cognitive processes, including visual recognition of an object, semantic and phonological retrieval, and motor articulation of the word (1). In visual confrontation naming (VCN) tasks, people are simply asked to name the pictures visually presented to them. Lesion studies, as well as different neuroimaging methods like positron emission tomography (PET) or electrical stimulation mapping (ESM) and functional magnetic resonance imaging (fMRI), have suggested that vastly distributed brain areas are involved in this process. These areas include perisylvian brain areas involved in word production (2-4), specially the left inferior frontal gyrus (5), ventral visual pathway, and occipitotemporal regions (6, 7). It has also been shown that core components of the word production network are mostly left lateralized (8). fMRI as a non-invasive imaging method, has been widely used to localize brain regions involved in language function. Picture naming and verb generation are the two tasks that typically activate all components of the word production network (8). Some recent fMRI studies have used verbal fluency paradigms as an indirect method to assess the role of the hippocampus in the naming function (9, 10). There have been some inconsistencies in previous literature on the role of the hippocampus in word production and visual naming. Traditionally, mesial temporal lobe structures, including the hippocampus, have been specified for episodic memory. However, there is growing evidence that indicates the role of the hippocampus in linguistic skills. While language certainly needs semantic memory, the involvement of the hippocampus in this cognitive domain has been surprising. Language deficits have been reported in many of the patients with temporal lobe epilepsy (TLE). Up to 40% of mesial TLE (MTLE) patients with hippocampal sclerosis in their speech-dominant hemisphere had significant impairment in their naming ability (11, 12). Mesial temporal lobe structures, especially the hippocampus, have been regarded as playing an important role in lexical memory and sound meaning pairing (13). More recently, accumulating evidence from PET and ESM studies, as well as fMRI studies, has shown that the hippocampus might have a direct role in naming function (9, 10, 14-17). On the other hand, some studies have failed to show the same results (18, 19). It has been argued that the hippocampus is not included in the core word production network (5). Some studies have suggested that the role of the hippocampus in picture naming may be mostly limited to its function in higher level visual processing (20). However, if the language-dominant hippocampus is involved in VCN, it can be regarded in favor of large-scale brain networks model (21, 22). Hence, it would be an improvement to the traditional assumption that each cognitive function is subserved by isolated operation of special brain areas. Whether or not the speech-dominant hippocampus is involved in VCN has considerable clinical importance. In many patients with refractory TLE, mesial temporal lobe resection (MTLR), including the hippocampus, may be proposed as an effective treatment. Predictions regarding the outcome of cognitive and especially language functions have been very important. Although the processing systems of different languages share common neural substrates, there have been some minor differences (23-25). Cultural differences also cause some changes in patterns of activation (26). The aim of this study was to investigate the neural network of VCN in the context of the Persian language. To the best of our knowledge, this is the first time that neural substrates of VCN have been studied on healthy, native Persian-speaking individuals. Our second interest was to verify the hypothesized role of the hippocampus regarding its clinical importance. 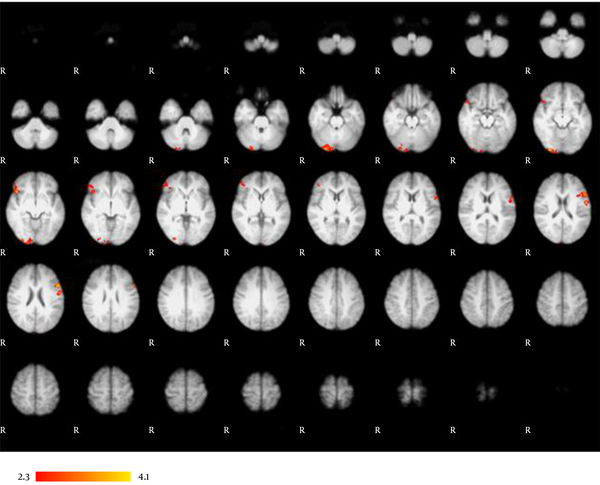 We assessed our hypothesis by combining direct VCN fMRI scanning with behavioral measurements of VCN performance. If the language-dominant hippocampus is involved in VCN, then better VCN performance should correlate with higher fMRI activation in this region. We studied a total of 20 healthy right-handed participants (7 males, mean age 34.42, SD 16.30; 13 females, mean age 31, SD 9.46). All participants were high school educated, and none of them had a neurological disease or cognitive complaints. Their structural MRI scans revealed no sign of abnormality. Two participants had to be excluded because they exceeded our cut-off for head motion (4 mm), and one participant had to be excluded due to technical malfunctions during scanning. The study had the approval of the local Ethics Committee and all participants gave appropriate consent. Persian was the first language of all participants. Handedness was assessed using the Edinburgh questionnaire (27). All subjects were provided with detailed instructions about the experiment in order to improve their ability to perform the tasks. All participants performed a naming test. The test was designed with similar timing to the fMRI task. Pictures were selected from a Snodgrass and Vanderwart picture database (28) that was normed for Persian speakers (29). The subjects were required to overtly name 60 pictures. The total number of items correctly named was recorded as their VCN performance score. Scanning was carried out on a 3.0T standard clinical scanner (Siemens MAGNETOM Trio) with a 12-channel head coil. T1-weighted three-dimensional anatomical images were obtained (Repetition Time (TR) = 1800 ms, Echo Time (TE) = 3.44 ms, flip angle = 7°, resolution = 1 × 1 × 1 mm3, 256 × 256 matrix). The time of acquisition lasted 4 minutes and 10 seconds. Functional T2*-weighted images were collected with blood-oxygen-level dependent (BOLD) contrast imaging, and a gradient-echo-planar imaging (EPI) protocol (TR = 3,000 ms, TE = 30 ms, flip angle = 90°, field of view = 192 mm2, 64 × 64 matrix, voxel size = 3 × 3 × 3 mm3, slice thickness = 3 mm). Each subject performed a VCN task. The task was block designed with active blocks of 24 seconds alternating with baseline blocks of 12 seconds. During the activation phase, subjects viewed black and white pictures every 4 seconds. Subjects were instructed to covertly name the pictures. They were asked to fixate on a crossline during the baseline condition. The total time for the task was 6 minutes. The subjects lay supine in the scanner. They viewed a semi-transparent screen through a non-magnetic mirror on the top of their heads. The visual stimuli were projected from the other side of the curtain with a video projector using Presentation software (www.neurobs.com). The subjects’ heads were restrained with a moldable air bag to reduce head motions. VCN performance scores were assessed using the statistical package for the social sciences (SPSS), Ver. 16 (SPSS Inc., Chicago, Il, USA). A Kolmogorov-Smirnov test with the Lilliefors correction was performed to determine whether an assumption of normality was appropriate. The fMRI data were analyzed using FEAT (fMRI Expert Analysis Tool), part of the FSL Software package (FSL, version 4.1.4, FMRIB, Oxford, UK, www.fsl.ox.ac.uk/fsl) (30, 31). The following preprocessing steps were applied to the scans of each subject: Head motion correction using motion correction FMRIB’s linear registration tool (MCFLIRT) (32); skull-stripping to remove non-brain tissues using the Brain Extraction Tool (BET) (33); spatial smoothing using a Gaussian kernel (full-width-half-maximum = 5 mm); mean-based intensity normalization of all volumes by the same factor; and high-pass temporal ﬁltering to reduce low frequency artifacts. Naming effect was estimated according to the general linear model (GLM) (34). Single-subject analysis was performed using FMRIB’s Improved Linear Model (FILM). For each subject, GLM analysis was performed by creating a boxcar function of task against rest, followed by convolution with a canonical hemodynamic response function and its temporal derivatives. Parameter estimates for the regressor of interest (VCN) against the baseline was then calculated for each voxel. Registration to the structural image and the MNI 152 atlas was carried out using FLIRT (35). For each subject, one contrast image was produced. Group-level analysis was performed using FMRIB’s Local Analysis of Mixed Effects (FLAME). The contrast image of each subject (naming relative to baseline) was entered into a second level analysis to compute the mean activity. For the correlational analysis, the subjects’ VCN performance was entered as a covariate in the model. Activation on the Z (Gaussianized T/F) statistic images was computed at the threshold of Z > 2.3 and a cluster significance threshold of P < 0.05 corrected for whole-brain multiple comparisons (36). In view of our hypothesis, region of interest (ROI)-based analysis of the hippocampus was also performed to decrease multiple comparison errors and facilitate additional assessments. ROIs of the hippocampus and inferior frontal gyrus were defined using the probabilistic Harvard-Oxford atlas. Higher level analysis in the hippocampus ROI was performed to obtain a more accurate estimate of the association between activation in this area and VCN performance. Mean BOLD signal change (in percentages) in the hippocampus ROI during the naming phase versus fixation was also extracted for each subject using FSL Featquery. The extracted data were then entered into SPSS to produce a scatter plot and to determine the correlation significance between VCN performance scores and the mean fMRI signal change. This was performed to provide some additional insight into the variability of fMRI response across subjects. Laterality Indexes (LI) were calculated for each participant and each ROI using the formula LI = (L − R) / (L + R), where L and R were the number of significantly activated voxels (Z > 2.3, P = 0.05) in the left and right hemisphere, respectively. We considered positive LIs to indicate left hemisphere lateralization and negative LIs to indicate right hemisphere lateralization (37). LIs were then examined for statistical significance using a within-group one-sample t-test at a corrected P ≤ 0.05. Table 1 presents the demographic data of the subjects as well as their VCN performance scores. Performance scores were normally distributed (Lilliefors test of the null hypothesis, P = 0.2). We observed a significant difference in VCN performance among the subjects. The statistical significance of VCN performance scores was assessed using a within-group one sample t-test (P < 0.0001). Table 2 and Figure 1 present the main effects of VCN in whole-brain analysis. Consistent with previous studies, strong activation was demonstrated in the left inferior frontal gyrus. Activation in the inferior frontal gyrus was left lateralized among all of the subjects (P < 0.05, z > 2.3). Activation was also found in the right inferior frontal gyrus that extended toward the right orbital frontal gyrus. LIs for the inferior frontal gyrus are presented in Table 1. Activation in the right lateral occipital gyrus and the right occipital fusiform gyrus extended to the right occipital pole. Figure 1. The main effects of VCN. Whole-brain analysis reveals left lateralized activation in the inferior frontal gyrus. VCN tasks mainly produced activation in the left inferior frontal gyrus, right inferior frontal gyrus, right lateral occipital gyrus, right occipital fusiform gyrus, right occipital pole, and right orbital frontal cortex. Results are displayed at a signiﬁcance threshold of P < 0.05, corrected for family-wise error. The correlation between VCN performance and fMRI activation in the whole-brain analysis is included in Table 3 and Figure 2. VCN performance was significantly correlated with fMRI activation in the left temporal pole that extended to the left middle temporal gyrus and left superior temporal gyrus. Activation in the left occipital fusiform gyrus extended to the left temporal occipital fusiform gyrus. Figure 2. Correlational analysis. Left-dominant activation in an occipitotemporal network correlates with subjects’ VCN performance. This network is comprised of the left occipital fusiform gyrus, left temporal occipital fusiform gyrus, left middle temporal gyrus, left superior temporal gyrus, and left temporal pole. Results are displayed at a signiﬁcance threshold of P < 0.05, corrected for family-wise error. ROI-based analysis of the hippocampus was also performed to reduce multiple comparison error. We could thus obtain more sensitive measures of activation in this small area. ROI analysis revealed a significant correlation between VCN performance and fMRI activation in the left hippocampus, which is presented in Table 4 and Figure 3A and 3B displays the correlation between each subject’s VCN performance and fMRI activation at peak voxel. 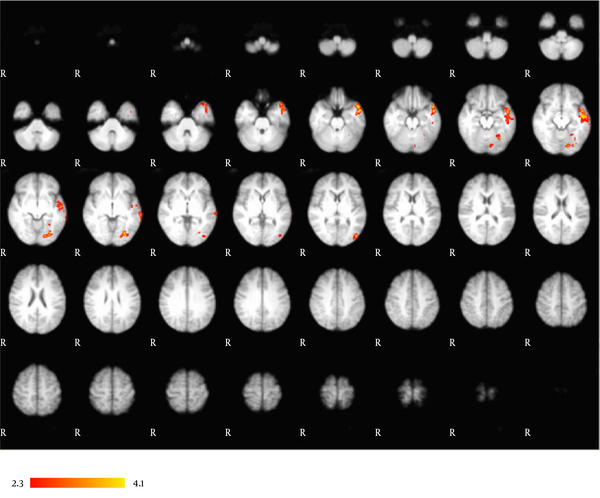 The diagram in Figure 3C illustrates how better VCN performance is related to greater fMRI activation in the left hippocampus among the subjects (P < 0.05). We found that the activation of the hippocampus among the subjects was mostly left lateralized (P < 0.05, z > 2.3). The hippocampus LIs are presented in Table 1. Figure 3. ROI analysis of the hippocampus. 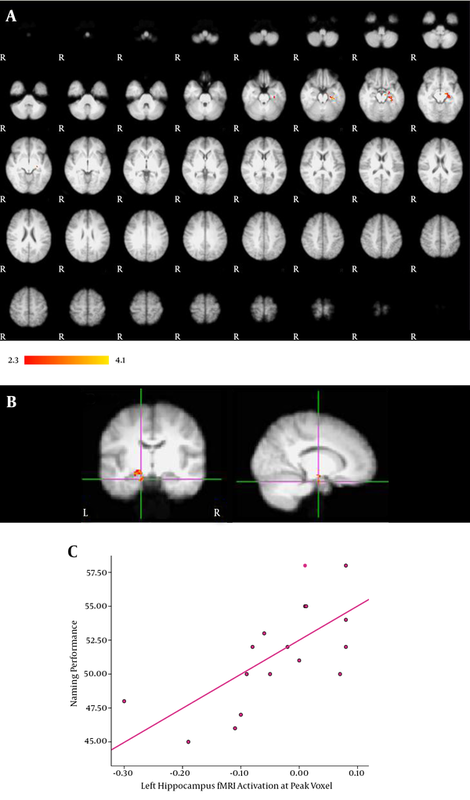 A, Activation in the left hippocampus significantly correlated with VCN performance; B, The activation map displaying the correlation of fMRI signal with VCN performance at peak voxel in the left hippocampus; C, A diagram illustrating how VCN performance score is related to fMRI activation at peak voxel. Greater fMRI activation was related to better VCN performance score. Results are displayed at a signiﬁcance threshold of P < 0.05, corrected for family-wise error. In this study, we investigated brain activation patterns associated with VCN in Persian-speaking individuals. There is also accumulating evidence in prior studies that indicate a significant relationship between hippocampal pathology and naming deficits (9, 11, 12, 15). These results support the left hippocampus as a worthy candidate for further investigation in VCN studies. Thus, we sought to determine whether a correlation existed between VCN performance and hippocampal activation in healthy Persian-speaking individuals. Our study was based on the hypothesis that better VCN performance should be accompanied by higher hippocampal activation in the language-dominant hemisphere. Some advantages could be mentioned for this study. First, it is the first time that a VCN study using an fMRI technique has been performed on Persian-speaking individuals. In addition, the small size of the hippocampus and its proximity to air-filled sinuses makes obtaining reliable signals from this region more difficult than other cortical areas (38). For example, in Deleon et al.’s (19) fMRI naming study, no activation was reported in the hippocampus. However, they only used 34 pictures as visual stimuli for their naming task. The second advantage of our study was the large number of pictures used and the long duration given to the active phase, which helped us to better see the activation of the hippocampus. Hippocampal activation has not also been reported in another fMRI study by Kemeny et al. (18). Regarding that the task design was event related the duration of active phase was quite low. The block design task used in our study is more likely to evoke sufficient neural activity in small brain areas like the hippocampus. In order to investigate the direct role of the hippocampus in picture naming, we assessed the correlation between VCN performance and hippocampal activity. In a series of studies by Bonelli et al. (9, 10) verbal fluency fMRI task was used as an indirect approach. They demonstrated a significant correlation between fMRI activation in the language-dominant hippocampus and VCN performance; however, fMRI activation was produced by a verbal fluency task in their study. In our study, we directly applied a VCN fMRI task to assess the hypothesized role of the hippocampus in naming. Visual naming task comprises several steps, including object recognition, object identification, and assigning a name to the recognized object (39). It requires the interaction of ventral visual streams and medial temporal memory structures. We have found a left lateralized network of occipitotemporal regions that show significant correlations with VCN performance. The left fusiform gyrus is generally among the brain areas activated during picture naming, but not word generation tasks (5). Hence, it is probably not included in the core network of word production. Our finding of the correlation between left occipital fusiform gyrus activity and VCN performance indicates the visual processing and conceptual preparation phase of naming in healthy subjects’ performance. Activation was also found in the left middle temporal gyrus. This area is commonly activated during lexical selection in picture naming tasks (8). Activation also extended toward the superior temporal gyrus, which is typically related to accessing a phonological code of words (8, 40). A significant correlation between left temporal pole activation and VCN performance was also demonstrated. Anterior temporal regions, especially the temporal pole, are commonly known to be involved in semantic processing (41, 42). The language-dominant temporal pole is also considered to be a mediational zone that applies lexical labels to perceived concepts (43-45). Whole-brain analysis of the naming task in this study also revealed activation in frontal regions. The left inferior frontal gyrus is among the core regions involved in word production (5, 46, 47). Activation was also found in the right inferior frontal gyrus and right orbital frontal lobe. As we expected, activation in the inferior frontal gyrus was significantly left lateralized among all of the subjects. Lesion studies provide some insight into the role of the hippocampus in naming. For example, most mesial temporal lobe epilepsy patients exhibit visual naming decline after MTLR. Surprisingly, patients with hippocampal sclerosis show a lower decline after surgery (48). These findings are in accordance with our finding of the direct role of the hippocampus in VCN. Meanwhile, there are some inconsistencies in the previous literature. Due to the scarcity of reports on the activation of the left hippocampus, it has traditionally not been considered an area involved in the core neural network of VCN (5). Some ESM studies have reported that the main naming areas reside in the anterior and lateral temporal (extra-hippocampal) cortex in MTLE patients (17, 49) and the decline in visual naming ability after MTLR has been attributed to the role of the hippocampus in higher level visual processing, rather than its direct role in VCN (20). In this study, the correlation of language-dominant hippocampal activation with VCN performance favors the direct role of the hippocampus in VCN. Our findings have potential clinical importance for patients with refractory mesial temporal lobe epilepsy. The functional adequacy of the tissue to be resected determines the risk of memory loss after AMTLR (50). In this sense, the role of the hippocampus in VCN implies that a functionally adequate language-dominant hippocampus could be an indicator of decline in visual naming ability after surgery in Persian-speaking individuals. In conclusion, this study has provided evidence for the direct role of the language-dominant hippocampus in picture naming in healthy Persian-speaking individuals. At the same time, we demonstrated a language-dominant occipitotemporal network that correlates with subjects’ VCN performance. Further studies are also required to determine the precise function of the language-dominant hippocampus in the VCN network. In this regard, designing activation protocols to provoke neural correlates of the different steps of VCN would be helpful. Authors’ Contribution: Haleh Khoshkhouy Delshad developed the original idea and the protocol, abstracted and analyzed data, and wrote the manuscript; Mohammad Ali Oghabian supervised the analysis and acquisition of data; Reza Nilipour and Majid Barekatain supervised the neuroscience concept. Dr. Oghabian (the corresponding author) is also head of the department. Funding/Support: This study was supported by Isfahan University of Medical Science and the research center for science and technology in medicine (Imam Khomeini hospital, university of Tehran).